Aging Software: Senior Care software for your center or area agency. Aging Software that makes life easier for you and your participants! We know that administrative tasks and paperwork never end. Much of your time and valuable resources as a manager or director is consumed with manual paperwork. Repetitive tasks such as data entry, applications for grants and other funding, and detailed reports for your agency or state. That’s why we created SENIORSTAT®, senior care software which tracks every action of every senior, every guest or volunteer at your center or area agency on aging and gathers the data for you automatically . No forms, no paperwork, no manual entry. Just set it and forget it aging software so you can focus on your Seniors saving you both time and money! Senior Meals, Activities, Trips & Home Services. SeniorStat Aging software: Reduce costs and streamline data collection. 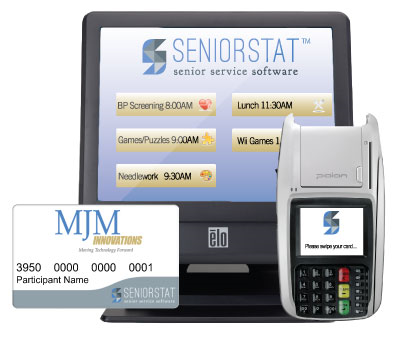 Our SeniorStat Swipe or Barcode Card, and Aging Software is specifically designed for senior centers, congregate sites and government agencies. You can provide accurate reporting, and save money, while enhancing the experiences of your participants or clients. Senior care software that makes life easier for your participants. SeniorStat is a proven senior care software system that electronically captures senior’s meals, activities and units of service. For your participants, it’s a convenient ID card that admits them to activities with a simple card swipe or scan. Depending on the activity or event, it can also replace cash payments, coupons, tickets, vouchers, or forms. Senior center services that makes life easier for you. Acquire reliable data about the impact of your services. With our proven, web-based aging software, you can generate the reports you need with no more than a few keystrokes and import data directly into NAPIS and other client aging software. Laborious data entry is a thing of the past. Electronically capture and import your data into most aging software systems. Provide state of the art reporting including NAPIS reporting. Capture services on touch screen computer, tablet or smartphone. Provide tracking and scheduling for home delivered meals and home care services with mobile apps. Lower costs by automatically capturing your program’s units of service. Potentially increase program funding by capturing each unit of service. Manage program information online, securely. Reduce paperwork for your client to a simple card swipe or scan: no more paper forms. 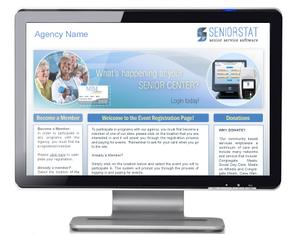 The SeniorStat solution can be adapted to existing hardware and senior care software. Discover more on how SeniorStat Aging software can help you reduce costs, streamline data collection, increase funding and make life easier overall. Request More Information from Our Experts!